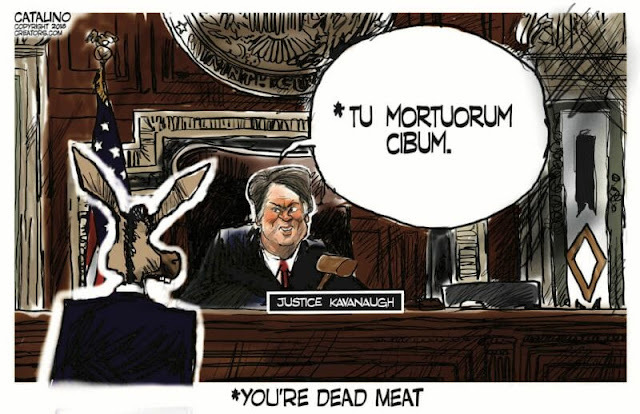 The cartoon below brilliantly illustrates what Democrats now fear the most about Brett Kavanaugh since it appears likely he’ll be seated on the Supreme Court to replace justice Kennedy. The Senate Judiciary Committee has engaged in a thorough and robust investigation of allegations raised against Judge Kavanaugh. Throughout the last month, Committee staff members have collected statements, letters, and calls from individuals around the country. The reports range from substantive allegations of sexual misconduct, to short messages to senators passing along internet rumors and theories. Committee staff continue to work tirelessly to pursue any and all substantive leads. In the course of the continuing investigation, staff members have spoken with 35 individuals, a task that requires extensive work during nights and weekends. More than 20 Committee staffers have contributed to the investigative efforts. The Committee has not received any evidence that would corroborate the claims made by Dr. Ford, Ms. Ramirez, Ms. Swetnick, or anybody else. In response to Dr. Ford’s allegations, Committee staff repeatedly requested an opportunity to interview Dr. Ford, but her lawyers repeatedly refused. Committee staff offered to fly to California or any other location to interview Dr. Ford. But as Dr. Ford explained at her hearing, she was not clear that this offer had been made. The Committee thus reopened the hearing on Judge Kavanaugh’s nomination. During the additional hearing day (Day 5), the Committee solicited more than 8 total hours of public testimony under oath from Dr. Ford and Judge Kavanaugh. In connection with the hearing, the Committee collected 24 pages of evidence from Dr. Ford in two productions. The Committee also received Judge Kavanaugh’s calendars. The Committee also received a statement, submitted under penalty of felony, from Dr. Ford’s ex-boyfriend, who cast serious doubt on the credibility of some of Dr. Ford’s testimony before the Committee. Notably, he stated that he had not known her to have any fear of flying or related claustrophobia and that she had previously provided advice to someone on how to successfully take a polygraph, directly contradicting her hearing testimony. Despite repeated requests by the Chairman, Dr. Ford still has not supplied several key items, including the charts from her polygraph examination, any recording of her polygraph examination, and the therapy notes that she claimed corroborated her story. Dr. Ford has not provided these therapy notes to the Committee, even though she shared these same notes with the media. In addition to conducting the hearing, the Committee obtained statements from the three individuals who Dr. Ford identified as being present at the 1982 gathering: PJ Smyth, Leland Ingham Keyser, and Mark Judge (who submitted two statements). Each person denied having any knowledge of the alleged gathering. Ms. Keyser stated that she does not even know Judge Kavanaugh and does not recall ever meeting him. And Mr. Smyth and Mr. Judge each said they had never witnessed Judge Kavanaugh engage in conduct of the kind described by Dr. Ford. The Committee contacted a total of 15 former classmates of Judge Kavanaugh and Dr. Ford. The Committee also received several statements, signed under penalty of felony, that support Judge Kavanaugh’s explanation of terms in his high school yearbook. Finally, prior to Day 5 of the hearing, the Committee staff conducted a transcribed telephone interview with Judge Kavanaugh regarding Dr. Ford’s allegations. The Minority staff refused to attend. In response to the allegations from Ms. Ramirez, the Committee contacted Ms. Ramirez’s counsel 7 times seeking evidence to support the claims made in The New Yorker. Ms. Ramirez produced nothing in response. Ms. Ramirez’s counsel refused the Committee’s request for an interview. Committee staff nevertheless pursued the investigation. Staff interviewed 5 witnesses with relevant information. Committee staff also investigated the public statements of 3 other individuals and found they had no knowledge of the alleged event. Prior to Day 5 of the hearing, Committee staff conducted a transcribed telephone interview with Judge Kavanaugh, subject to penalty of felony. He denied Ms. Ramirez’s allegations. Minority staff attended the interview under protest and refused to participate. In response to allegations by Ms. Swetnick, the Committee requested evidence on 6 occasions from her. Ms. Swetnick refused the Committee’s request for an interview. Despite this obstruction, Committee staff attempted to pursue the investigation by interviewing 12 witnesses who claimed to have relevant information. Committee staff obtained two sworn statements from individuals with knowledge of Ms. Swetnick’s character and allegations. Prior to Day 5 of the hearing, Committee staff also interviewed Judge Kavanaugh on these allegations on two separate transcribed telephone interviews, subject to penalty of felony—both before (when Ms. Ramirez’s allegations were also discussed) and after Ms. Swetnick was identified by name. Judge Kavanaugh denied Ms. Swetnick’s allegations, asserting that he does not even know Ms. Swetnick. Minority staff attended the interview under protest and refused to participate. In response to an anonymous allegation claiming Judge Kavanaugh pushed his girlfriend against a wall in a violent and sexual manner in 1998, Committee staff obtained a sworn statement from the woman dating Judge Kavanaugh at the time. She unequivocally denied that this incident ever took place. Committee staff also questioned Judge Kavanaugh on these allegations during a transcribed telephone interview, subject to penalty of felony. Like his then-girlfriend, he denied that the incident ever took place. Minority staff attended but refused to participate in the interview. The author of one allegation recanted in a public Tweet. The Committee referred the individual to the FBI for possible violations of 18 U.S.C. §§ 1001 (materially false statements) and 1505 (obstruction of congressional-committee proceedings). Committee staff questioned Judge Kavanaugh about the allegation during a transcribed telephone interview, subject to penalty of felony. He unequivocally denied the allegation. Minority staff attended but refused to participate in the interview. A second allegation was completely anonymous. Committee staff questioned Judge Kavanaugh about the allegation during a transcribed telephone interview, subject to penalty of felony. He unequivocally denied the allegation. Minority staff attended but refused to participate in the interview. A woman has subsequently begun contacting Senate offices, claiming to be the author of the anonymous letter. Even though there are doubts about the authenticity of her claim, Committee staff is investigating. The Committee’s investigation, like the FBI supplemental background investigation, has found that there is no corroboration of the allegations made against Judge Kavanaugh. and what exactly her job is with the cia ? And neither will the farce news mesia. The author of this cartoon only validates the DEMs charge that he is nothing but a GOP shill.